Hungary is a beautiful country and Budapest is a must see city if visiting. Budapest, once the cities of Buda and Pest, is a cosmopolitan European capital city. This capital has something for everyone, from intense history and showy architecture to healing thermal waters and a great food scene. Not to mention Budapest is an old city rich in history with a youthful atmosphere. 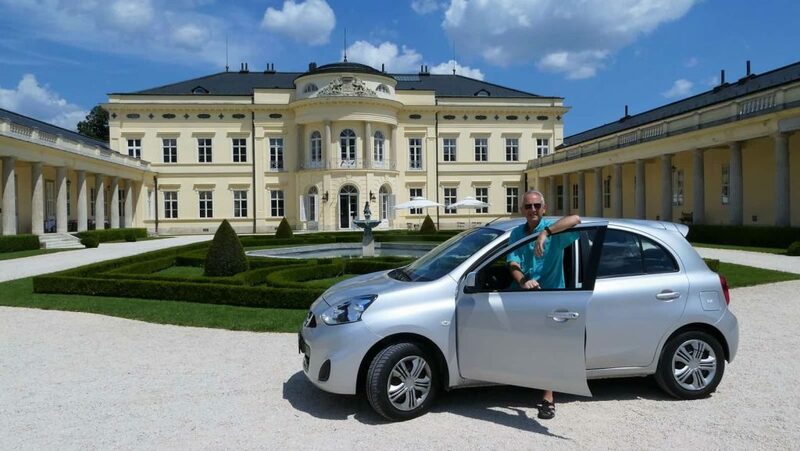 The hotel we chose was a beautiful manor house out in the country, so we decided to rent a car to go into Budapest and make a little road trip through the countryside. 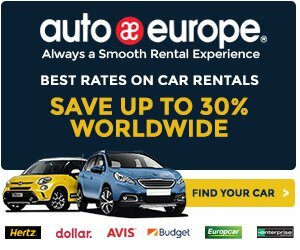 Auto Europe is a great rental company when traveling abroad. Most important, they have an easy to use website and search multiple car rental companies for the best deals. On our first full day in Hungary, we decided to take a day tour of Budapest. As you know, we are big fans of private tours, so we hired Ágota Bencze as our tour guide. She is an English-speaking tour guide, full of passion and knowledgeable about Budapest today as well as its history. We spent a full day touring all of Budapest with her, and we learned and saw so much. We drove into Budapest and met Ágota at the Hotel Gellért. She picked this place because there was free parking nearby along the river. Getting a chance to see this hotel was a bonus. 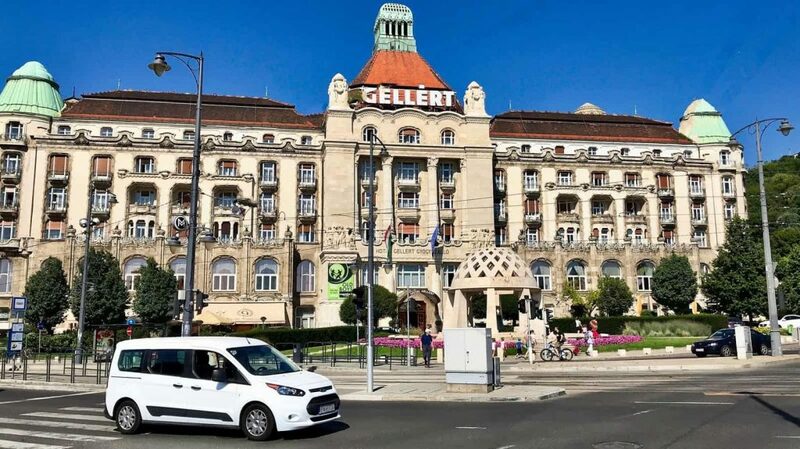 The Art Nouveau style Hotel Gellért first opened its doors in 1918 and has long been an iconic Budapest landmark even featured in Hollywood films. 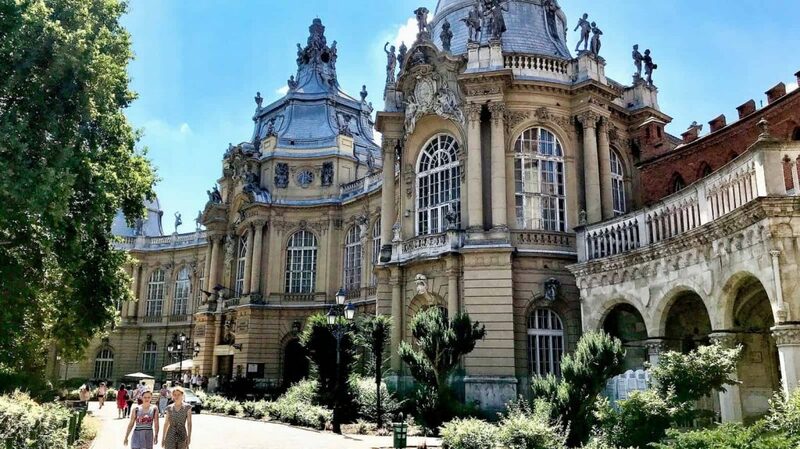 This large stately building also houses the world-famous Gellért Baths, which include an outdoor pool with an original wave-generating device installed in 1927. 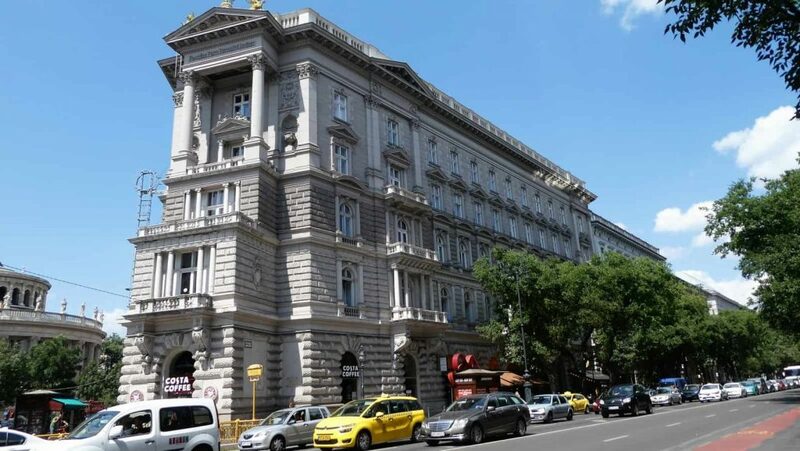 What’s more, many famous people have stayed at the Gellért including American presidents and European royalty. The hotel has an elegant atmosphere of a bygone era. We met up with Ágota and started our walking tour of the city. We had set aside only one day for Budapest, so we asked Ágota to pack in a lot for the day. The nice thing about a private tour is you can customize it how you want and Ágota graciously accommodated. To demonstrate, we even made adjustments to the plans midday. Our first stop on our tour of Budapest was the Buda Castle. This historic castle and palace complex was home to Hungarian Kings of Budapest. They constructed the castle in 1265, but it underwent many renovations mostly between 1749 and 1769. 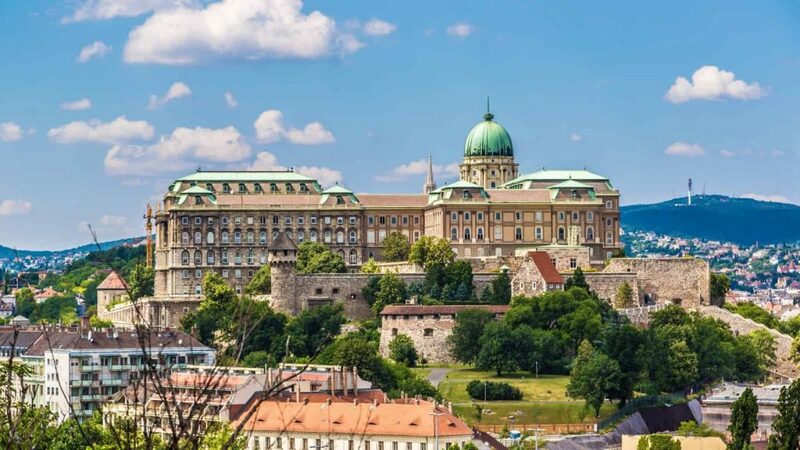 Historically, they referred to the Buda Castle as either the Royal Palace or Royal Castle. Presently, the castle is home to the Hungarian National Gallery and the Budapest History Museum. We walked the grounds as Ágota filled us in on the history. The castle sits on the southern tip of Castle Hill. Comparatively, just to the north is the Castle District, which is famous for it’s medieval, Baroque and Neoclassical houses, churches and building. In fact, in 1987, they declared this castle area of Budapest a World Heritage site. They built the Fisherman’s Bastion in 1902. 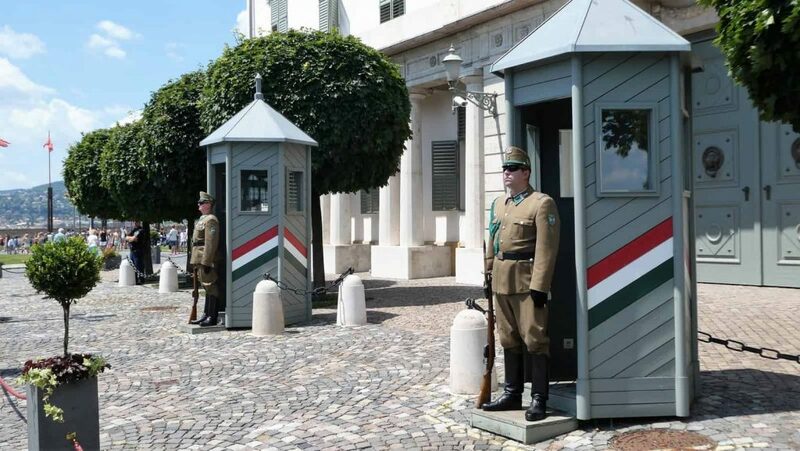 It was part of the development to celebrate the 1000th birthday of the Hungarian state. When constructed, it was intended to be a viewing station. Since they no longer used the castle for military purposes, they did not build the Bastion with thick walls like those intended to withstand war times. During World War 2, the Bastion suffered damage from the Germans but was rebuilt and renovated. The ornate design of the Fisherman’s Bastion makes it one of the most popular tourist destinations in the city. 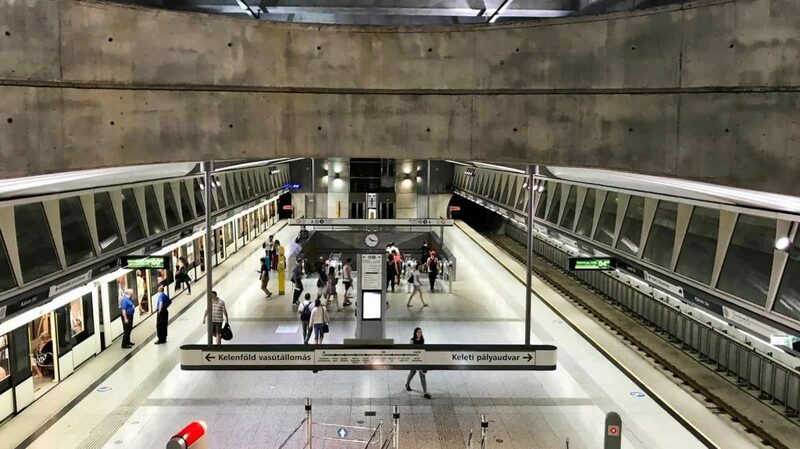 The design is open, with wide arches for better viewing and wide steps for ease of movement of the many visitors who come here daily. The Fisherman’s Bastion has seven spired towers. 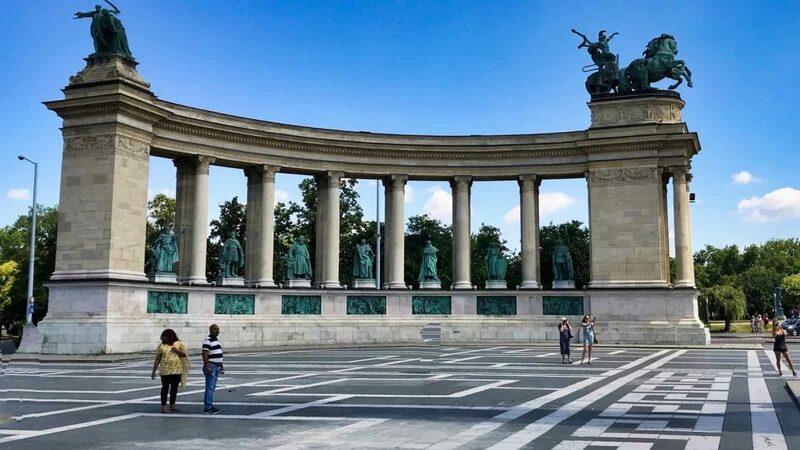 Correspondingly they represent the seven founding Hungarian chieftains that controlled this part of Europe that would go on to become Hungary. The Bastion overlooks a small part of the city called Watertown. Watertown, as it is called today, is where the fishermen of the city lived and worked, so hence the name — Fisherman’s Bastion. From this area today, you can enjoy the panoramic views of Budapest and the river Danube. 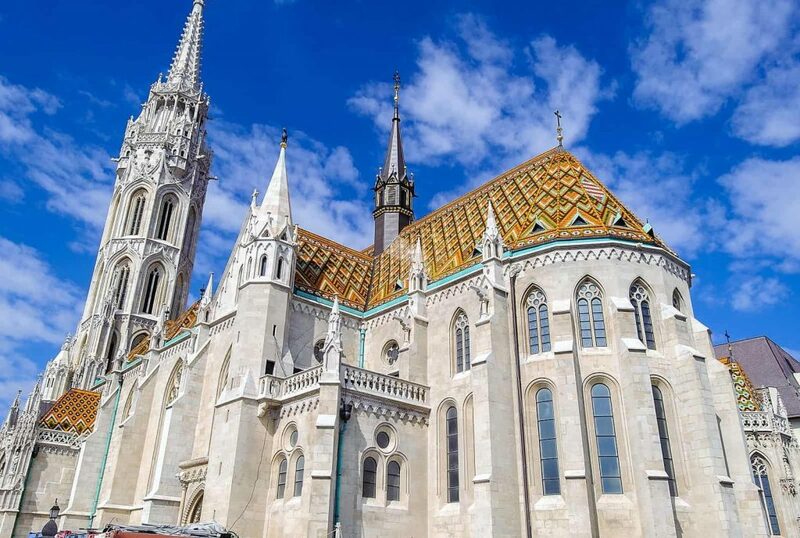 Also located on Buda Hill is the Roman Catholic Matthias Church. This Romanesque style church in dates back to 1015. After much destruction and seizes over the centuries, the rebuilds took on a more Gothic style architecture. They held the last two coronations of Hungarian Kings here. The interior of the church is breathtaking with frescos from floor to ceiling. Together with the pews are hundreds of years old, and you will find medieval remnants throughout. A few blocks away is the Budapest City Park. There is a lot more than just a park in this area. It starts with one of the major squares in Budapest, Heroes Square. Firstly, Heroes’ Square is the biggest square in Budapest. 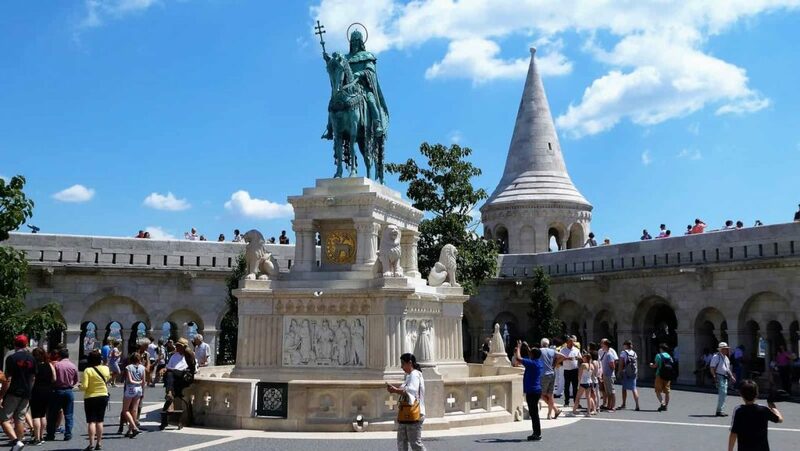 Firstly, it is dominated by the Millenary Monument, a 108-foot tall pillar topped by the golden Archangel Gabriel, holding the Hungarian crown and a cross, the square is intended to be symbolic. Hero’s Square is also a World Heritage Site. 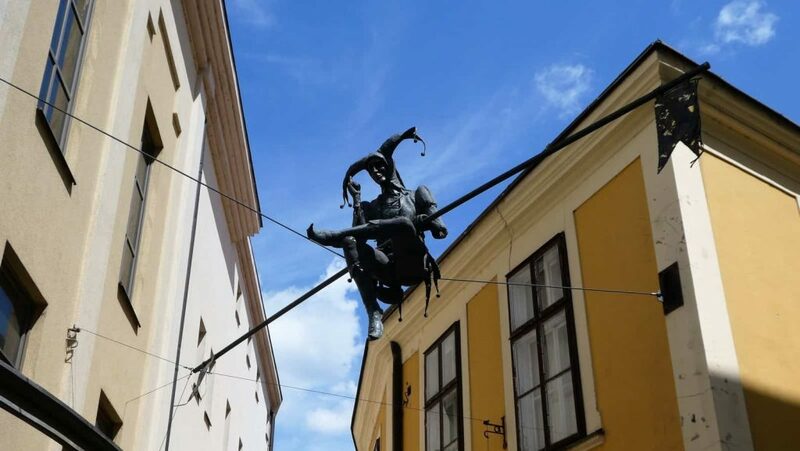 It’s most noted for its famous statues of the seven chieftains of the Magyars and other Hungarian leaders. 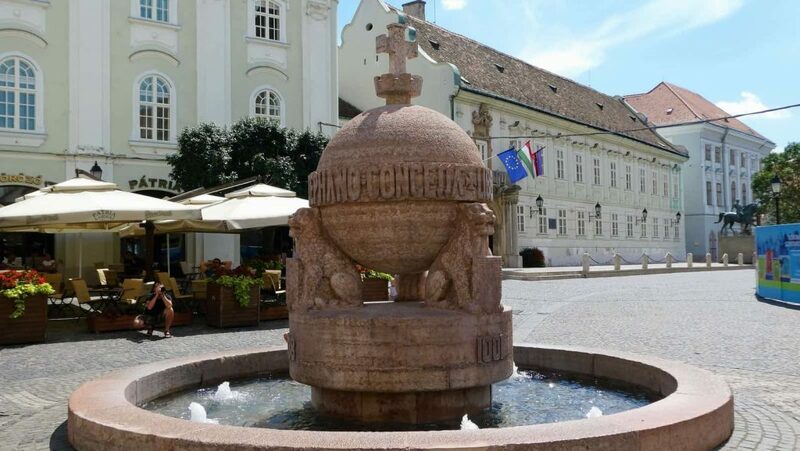 Created in the late 1800s, both Heroes’ Square and the adjoining city park, commemorate the thousandth anniversary of the Magyar conquest of Hungary in 895. Probably one of the loveliest places in Budapest is the Vajdahunyad Castle. Vajdahunyad Castle is part of the Millennial Exhibition of 1896. The castle was designed to feature copies of several landmark buildings from different parts of the Kingdom of Hungary. Hence the buildings are from various periods. As a result, you will find Romanesque, Gothic, Renaissance, and Baroque architecture styles. You’ll even find a statue of the famous Hungarian born actor Bela Lugosi who played the original Dracula. 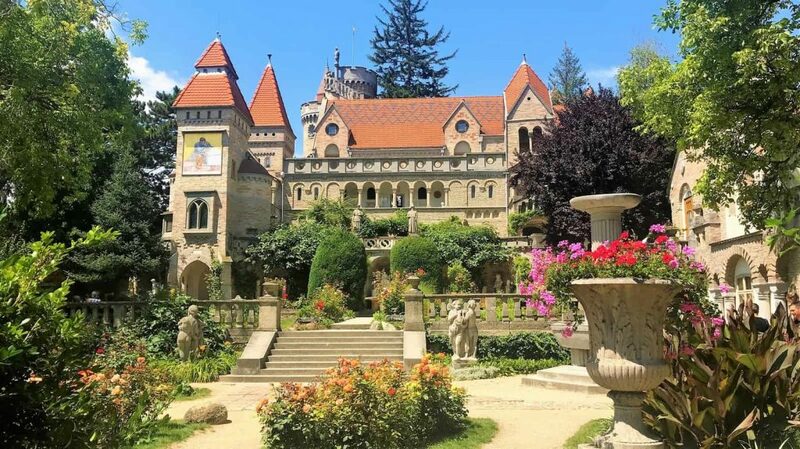 In truth, the Vajdahunyad Castle is a great place to walk around, grab a bite to eat and enjoy the entire goings on in the square. Vajdahunyad Castle is part of the City Park near the boating lake and skating rink. 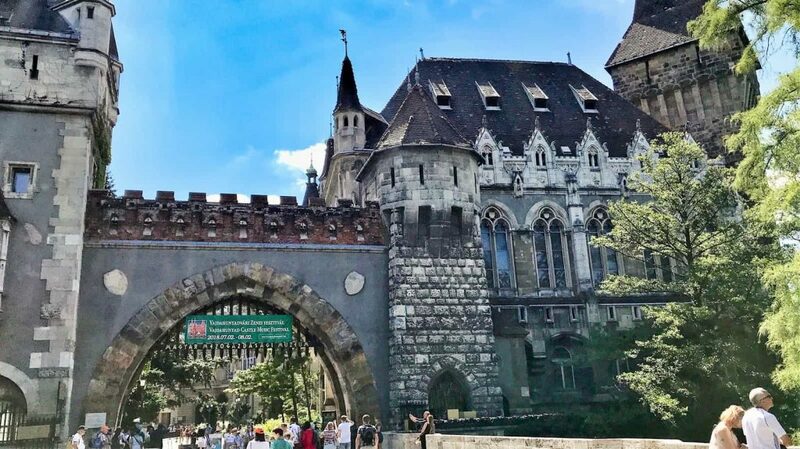 Located on a manmade island in the heart of Budapest very close to Hungary’s national monument, Vajdahunyad Castle offers an unusual contrast to its stately surroundings. On our visit, we came across this man playing the violin. Surprisingly, what was unusual was that the violin was just a block of wood and the noise was coming from a whistle type thing hidden inside his mouth. 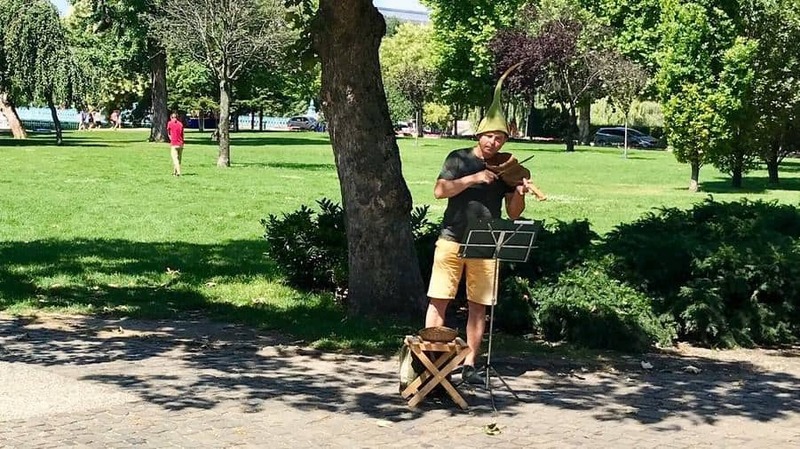 It was very humorous especially when the wind would blow over his music stand. Budapest has the highest number of thermal springs in the world. What’s more, seventy million liters of thermal water rise to the earth’s surface daily. 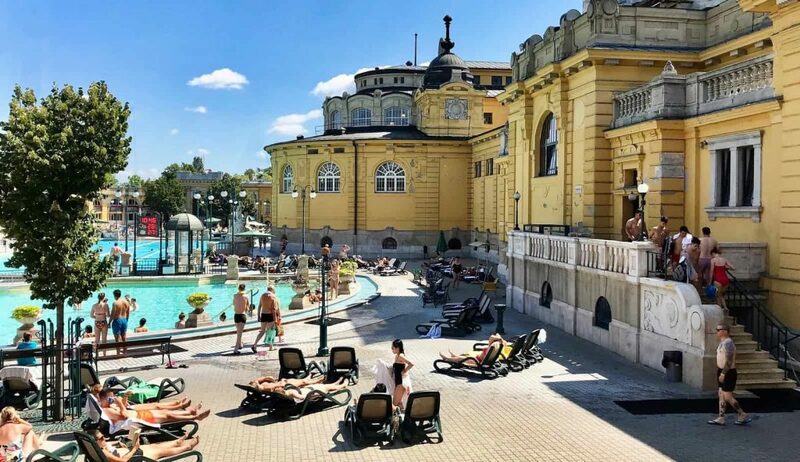 Just across the way from Vajdahunyad Castle is the famous Szechenyi Bathhouse. It is the largest medicinal bath in all of Europe. To that end, it has 21 pools. The water supply is from two thermal springs with temperatures of 165 F and 171 F respectively. We didn’t go into the baths but did go in the building. We walked around to see the facilities and they are grand. The outdoor pool was like an oasis in the middle of the city. The water in the thermal pools is high in minerals such as calcium, magnesium and hydrogen carbonate. All thought to be good for pain in the joints, arthritis, and circulation. Besides the pools, they offer other therapeutic services like massages. Budapest has an excellent public transport system. Our guide Ágota bought us transportation day passes, so we hopped on the subway to go across town to visit the Hungarian Parliament building. 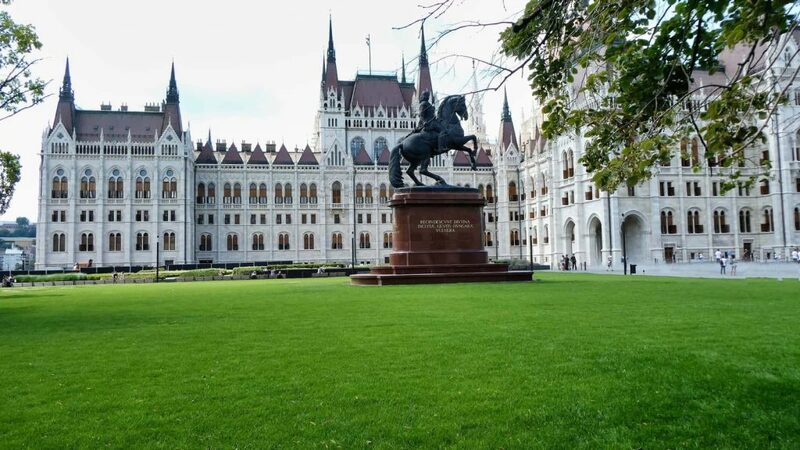 The Parliament Building is the largest building in Hungary and the tallest in Budapest. 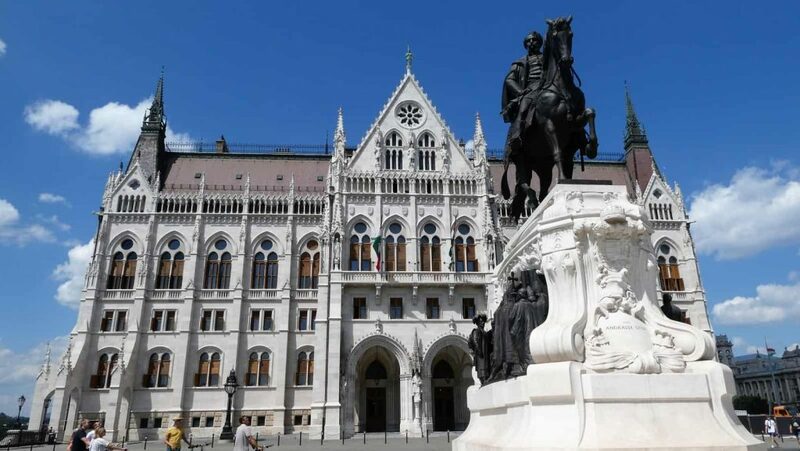 This beautiful building is on the banks of the Danube and houses the National Assembly of Hungary. They finished construction of the building in 1904. In fact, the plans for this building came from an 1885 international competition among architects to come up with the best design. Sadly, the winning architect went blind before the completion of the building. They built the Parliament Building in the Gothic Revival style. 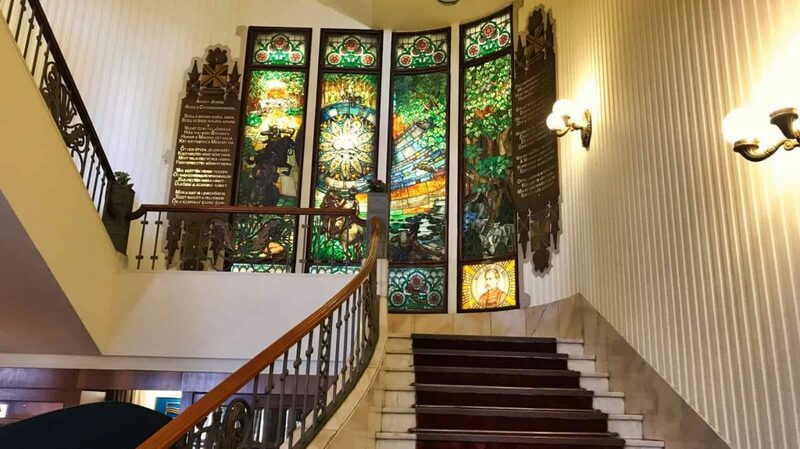 When you enter the building, you walk up an immense ornamental staircase. What we found most interesting is the building’s symmetry. There are two identical halls on the left and right. Hence they use one for politics and the other for guided tours. Because of the detail of this building, its size, and the fact that modern air pollution constantly attacks the porous limestone walls it is usually under constant renovation. Later they built the second and third place architectural contest entries across the way facing the Parliament building. At this time they house the Ethnographic Museum and the Hungarian Ministry of Agriculture. The day was ending, and the sun was setting, but we managed to fit in a Danube river cruise. 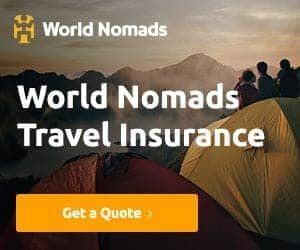 I think if you are visiting Budapest this is a must! On the docks are many boats that offer river cruises. Since it was getting late, Ágota (our guide) had to find one that was still running, and after a quick dash down the docks, we found one. The Danube is one of the world’s greatest rivers. Overall, it is the second longest in Europe. The Danube flows through 10 countries originating in Germany and ends in Ukraine flowing into the Black Sea. Consequently, the cruise was a nice relaxing way to see the sites from the water. The view from the cruise was quite a different perspective than on foot in the city. You get some great views of the Hungarian Parliament and some of Budapest’s fantastic bridges. We had a full day of seeing Budapest. However, you could easily spend three days touring. We only had one, so we commend our guide Ágota for picking the best places to see and getting us through our itinerary. You can tell she loves the city and knows the history. I don’t think we stumped her once with all of our questions. Consequently, if you want to get the most out of a day tour, we highly recommend a private one. It’s well worth the little extra cost. Seeing the sights in Budapest is great. But, getting out of the city to see the smaller villages can give you a complete feel for Hungary. On the next day, we decided to hop in our Auto Europe rental car and take a drive into the countryside. 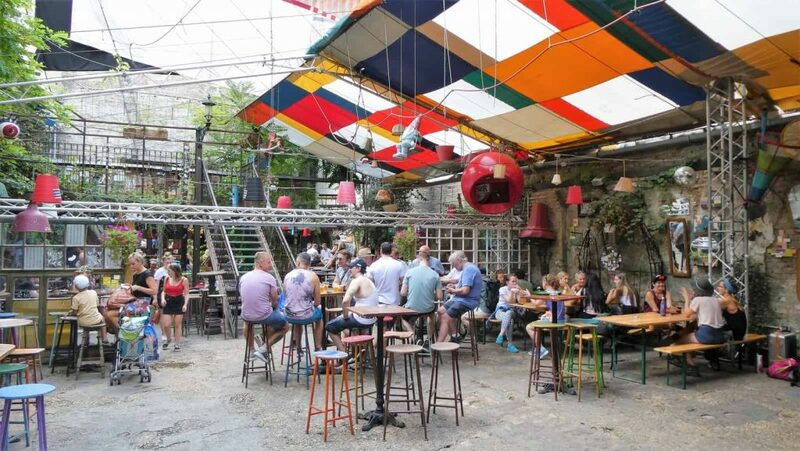 Firstly we looked up some of the best things to see and do outside of Budapest on TripAdvisor. Our goal was to see places less than an hour drive of where we were staying. 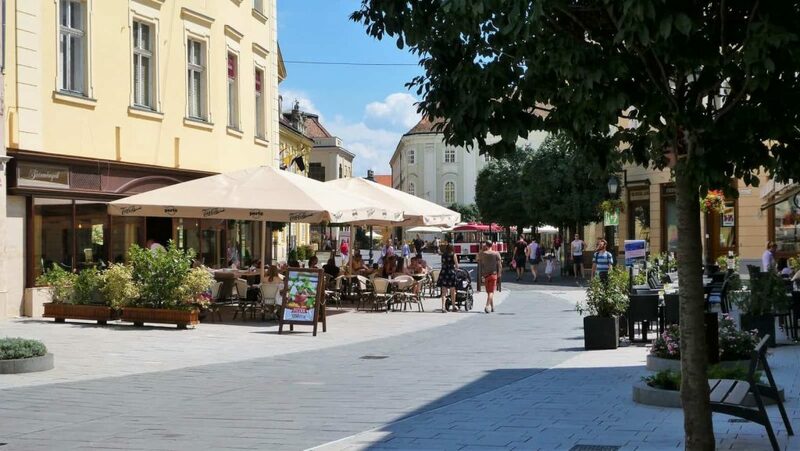 We decided to visit the city of Szekesfehervar, which is the old capital and the ninth largest city in Hungary. While in the city, we were on a quest to see Bory Castle, Sovereign’s Orb, the Viragora Flower Clock, and the Orajatek. Our first stop was not far from the old town of Szekesfehervar. In a residential neighborhood sits Bory Castle. Part of the draw to come to visit this castle is its location. Bory Castle sits in an everyday suburban neighborhood. The story of the castle begins in 1912 when Jeno Bory purchases one-acre of land near Szekesfehervar. Bory grew up in Szekesfehervar as one of seven children. The property Bory bought had a little wine cellar, and Bory spent summers there. After WWI he built his home on the property considered by him a work of art, similar to a statue rather than a building. Bory was not only the architect but also the mason as well. In addition, the Guinness Book of Records lists Bory Castle as the largest building that someone built with his own two hands. Bory’s home grew over the years into the castle it is today. The Bory castle is 90 feet high. It has seven towers and thirty rooms. The Sovereign’s Orb depicts one of the crown jewels of Hungarian kings. It takes center stage in the main square of the city. The inscription running around this creation means: This is a free city by the grace of St. Stephen. 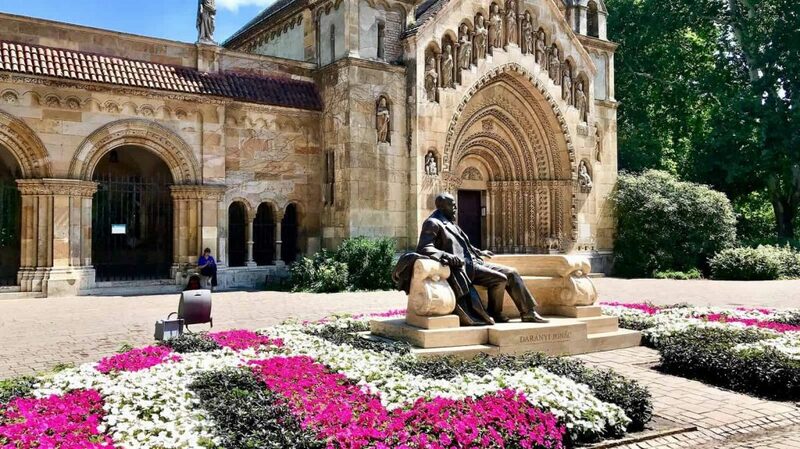 Szekesfehervar assumed its free royal city status when St. Stephen, the founder of the state deemed it so. The countryside of Hungary is beautiful. The tree-lined winding roads made driving serene. When you arrive at this area, you can’t see the city, that is because the old town is completely pedestrian only. We parked our car and followed Google maps into the city center. 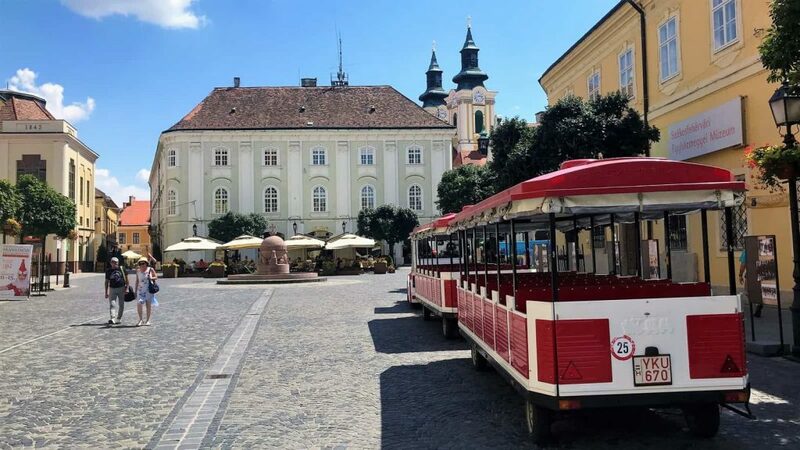 Szekesfehervar is one of the most ancient towns in Hungary, dating to the late 900s. The city with its cobblestoned streets is meticulously clean and manicured. In addition, there are plenty of restaurants, coffee bars and bistros. 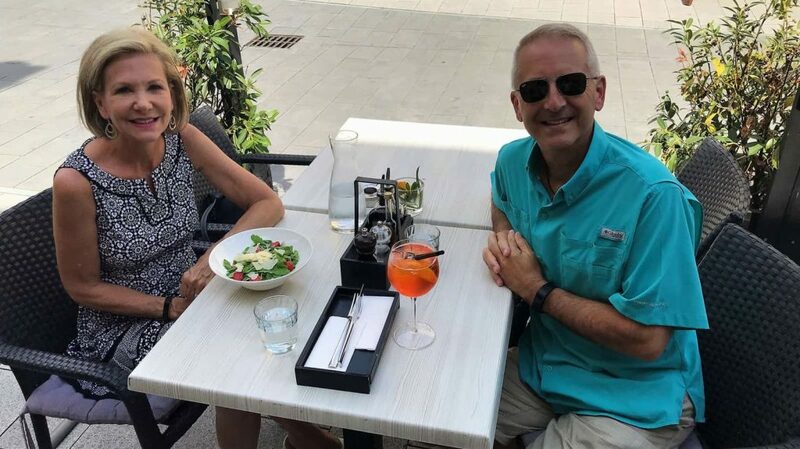 Our visit was during the summer, so we enjoyed some light bites and a glass of wine dining al fresco. 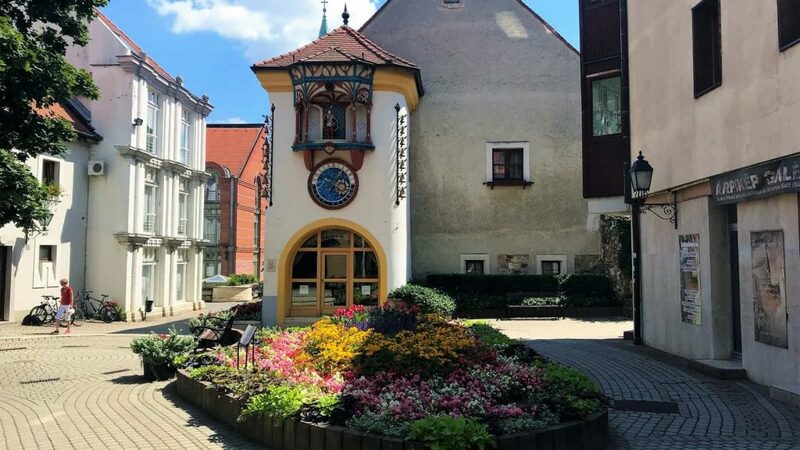 One of the interesting attractions in Szekesfehervar is a garden clock that began in 1960. As a result, each spring new flowers give the clock a new life. The clock tells the correct time from spring until autumn. What’s more, next to the clock is the date. 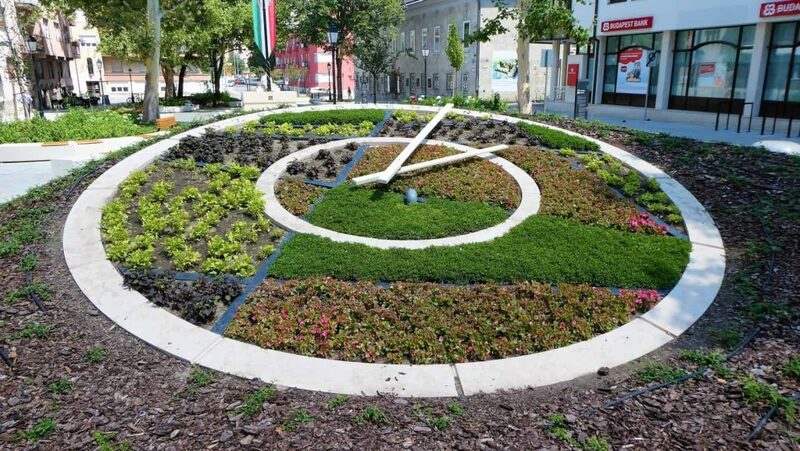 Another attraction in Szekesfehervar is the animated clock. Important to realize, the characters of the clock represent the legendary kings and well-known people of Hungarian history. The historical figures first appear at 10 in the morning along with the music. Then the clock comes to life again every two hours until six p.m. The figures of the clockworks are the trombone player, St. Stephen, Prince Emeric, King St. Ladislaus, St. Elizabeth, St, Margaret, King Mathias, and Queen Beatrix. Below where the figures come out is a dial. The dial is a star map listing the names of the months. The dial rotates adjusting the correct picture to the name of the month thus going around the face of the dial once a year. There is also a clock museum. As a matter of fact, the Clock Museum has many hundreds of wall-clocks, grandfather clocks, pocket-watches, wrist-watches and even the mechanism of a tower clock from the 17th century. You can visit the museum, but a reservation for a minimum of 10 people is required. There are plenty of things to see and do in and around Budapest, Hungary. And why not only see but learn about Budapest with a private tour by Ágota Bencze. For the most part, by visiting the countryside and the big city, you can get a great feel for Hungarian life. 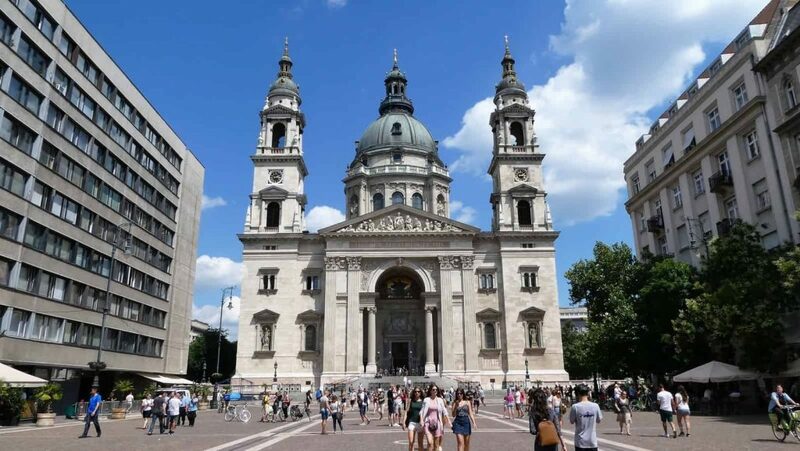 Hungary will thrill you with its history, architecture, culture as well as its food and drink scene. And we highly recommend renting a car for your travels from Auto Europe. 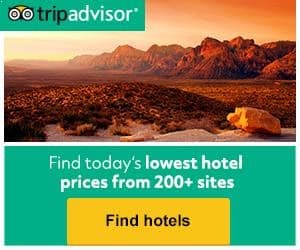 What are the best things to do in Budapest Hungary? 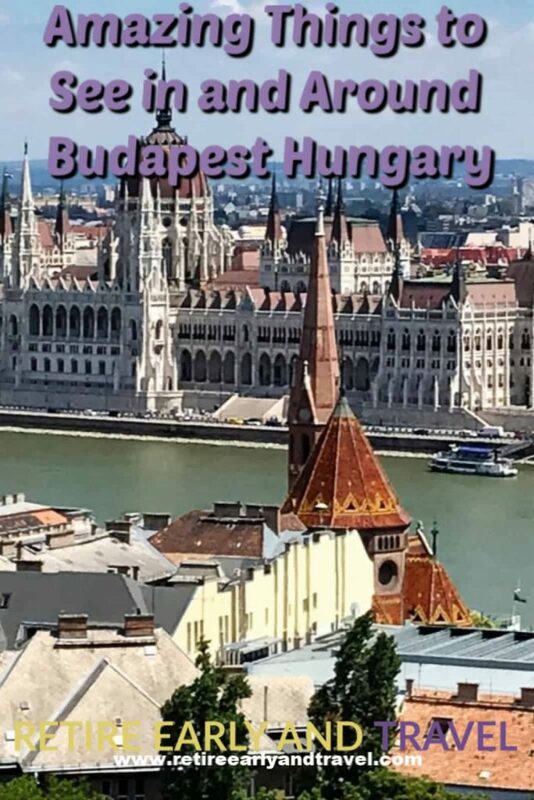 Buda Castle, Fisherman’s Bastion, Matthias Church, Danube River Cruise, Parliament Building, Vajdahunyad Castle, Heros Square, and the Szechenyi Thermal Baths. 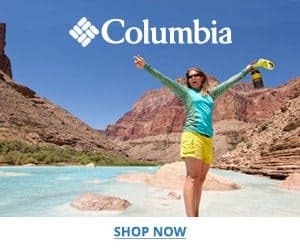 What is the best city to visit outside of Budapest in Hungary? Szekesfehervar, the former capital of Hungary. It is a delightful city with lovely cafe’s and sights to see. You’re welcome Sairam. Thanks for visiting. It look wonderful place to visit there. You’re welcome, Roslia. It was a beautiful city. Budapest is incredibly nice during my last visit. Personally, I would also recommend the same things you’ve listed here. 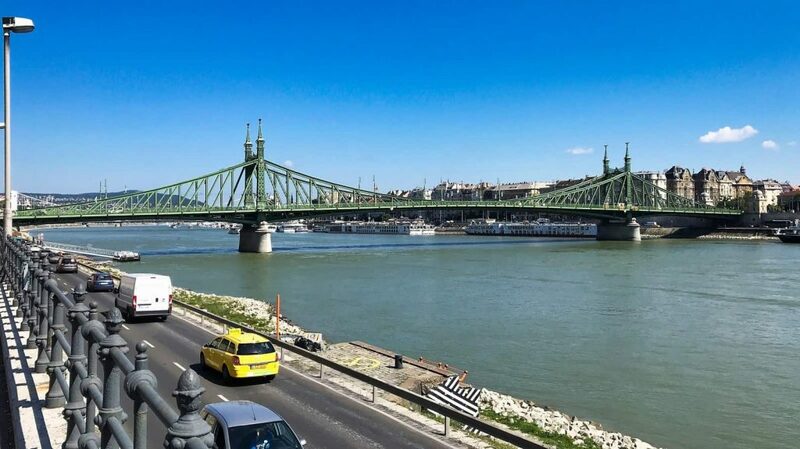 I explored Budapest on a bike and it was the most thrilling experience ever! Thanks for the comment Agness. Budapest would be a great place to bike. 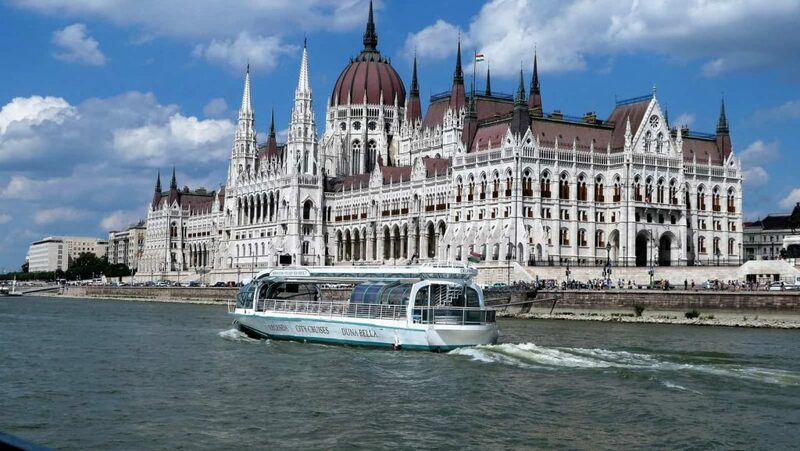 Oh your post brought back so many beautiful memories of Budapest.A must visit city for sure.Amazing architecture,the bridge,the parliament along the river Danube.Still so fresh in my mind though had travelled as a kid in year 2000. Loved reading your post. Definetly a place I’ll soon visit along with my hubby and kiddo. 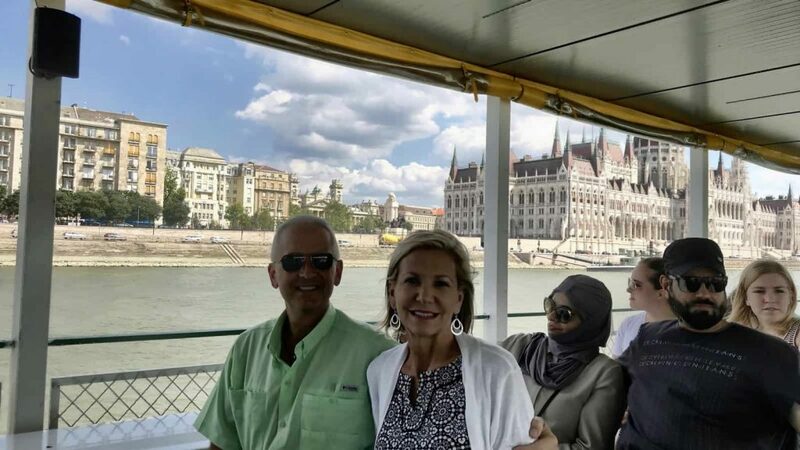 We are glad you were able to visit Budapest. It was a beautiful city. So much history. Thanks for commenting! 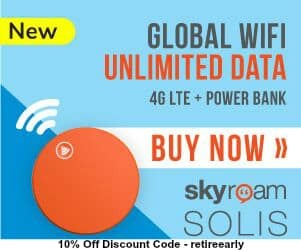 Found your post interesting to read. I cant wait to see Budapest soon. Good Luck for the upcoming update. Thanks. Budapest was a beautiful city with so much history. Budapest is an amazing city with great history and beautiful architecture, do visit Budapest.